Due to my search for artistic growth my blog and site have been dormant for...oh....a little over 3 years now. Almost 4, for those keeping track. Art is funny that way.
. For any of you out there still paying attention. Also in the works is my storefront. Soon you'll be able to purchase prints and originals. If that tickles your fancy. See ya soon. A little something I did at Cleveland Drink and Draw Social Club last night. 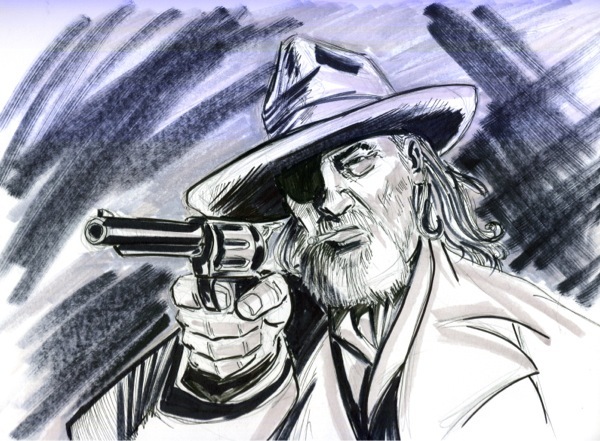 Inspired by Jeff Bridges performance as Rooster Cogburn in True Grit. Pen and ink with marker. Tags: chelzostudios, Jeff Bridges, True Grit, Rooster Cogburn, Jim Giar, Western. A little something I did over at the Rust Belt MOnster Collective for Batman week....or at least the penciled version. You can head to the RBMC site http://www.rustbeltmonster.com/2012/08/week-27-batman-begins.html to see the final inked version. As always thanks for looking. J. A colorized version of a Godzilla piece done for an editor as a going away gift. You can head to the Rust Belt Monster blog http://www.rustbeltmonster.com/2012/08/godzilla.html to see the inked version before color. As always...thanks for lookin'. J. The lined inked version of the fan art piece I did for Ben and Time Trumans creation, HAWKEN. Click on the link to see my take on the favored TMNT. Over at the Rust Belt MOnster Collective we all paid tribute to the artist known as Moebius who passed away earlier this month. Like many of the artists that have influenced me, I never appreciated their later in years as I spent a lot fo timke trying to find my own voice. But once their gone...like any old friend or family member, you realize how they influenced you and helped shape you into the artist...or person, you've become. I've never read Blueberry, a title touted to be the greatest western comic/ graphic novel ever written. So once word spread of his passing I ran across a few pieces of his. And what struck me right off the bat, was his attention to backgrounds. His appreciation for the beauty and majesty of the land where many a man, woman and child battled for survival in the unforgiving wild west.